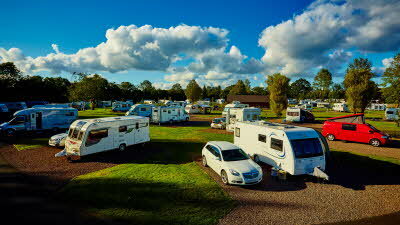 Blair Drummond Caravan Park is a charming park set within and around the old walled garden of Blair Drummond House. The sheltered site is surrounded by fine mature trees and shrubs. Adjacent to the site old amenity woodland is under renovation and there are interesting paths with wonderful displays of rhododendrons and spring bulbs. Blair Drummond Caravan Park is set within Blair Drummond Estate and there are many quiet private tracks and roads safe for walking and cycling with children. Quarry Loch, the adjacent River Teith and woodlands provide ample opportunity for bird watching. Adjacent to the site Blair Drummond Safari Park houses Scotland's only elephants and is a brilliant day out. 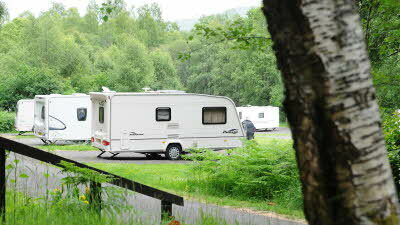 Caravan Park visitors can buy tickets allowing multiple visits for the cost of a standard ticket. Blair Drummond provides an excellent base for exploring the local area. We are a gateway to the Highlands and Edinburgh and Glasgow are both under an hour away. Both have wonderful museums, all free, and several recently renovated. Stirling and Doune Castle are both ten minutes away. There are great beaches in Fife, Munroes to climb and Loch Lomond National Park, all within a few miles. Oban, Loch Fyne and Glen Coe are all within an easy days drive. Quiet cycle routes on minor roads are within easy access from the caravan park. TV good signal on site is good with satellite box available to loan. To enquire please call the site on 01786 841208. The nearest National Cycle Network route to this site is route number 76, Preston to Keswick. Sainsburys, Tesco and Morrisons supermarkets can be found in Stirling, about 6 miles away. 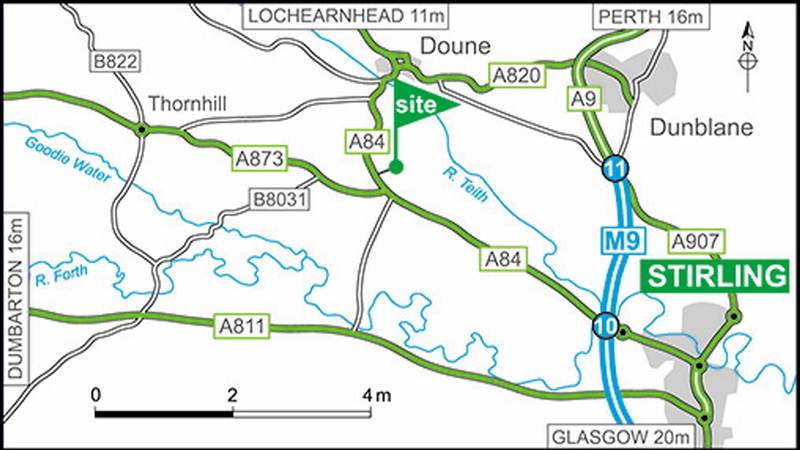 From M9: Leave M9 at junction 10 onto A84 (signposted Crianlarich). In about 4 miles (just past church on left) turn right at Cuthil Brae. Continue up and over the hill, the park is on the right before the cattle grid. Please beware of the speed ramps. From the North: Leave Doune on A84 signposted Stirling. About 2 miles from Doune turn left at Cuthill Brae. Continue as above. Please arrive after 12:00pm. We stayed here in late August. Set just off the A84 main road from Stirling to Callander this site is a little gem situated inside what was in a previous life a walled garden. 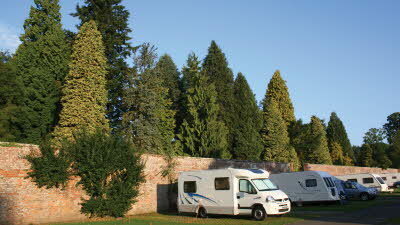 Lovely location with immaculately maintained grounds and lovely manicured lawns between pitches. Best hard standing pitches we have come across with concrete blocks and plenty of soft spaces to peg out your awning. Toilets are well maintained and clean, but some showers are showing signs of becoming a little tired and in need of some tlc. The signs are that this was once a Caravan & Motorhome Club site by the way it is laid out and features such as electric hook up posts and service points. No TV reception but Freesat box provided FOC from the site office on request. A fish & chip van visits on Friday & Saturday evenings and is very popular. No recycling which seemed quite strange for such a well organised and maintained site. Big well equipped children’s play are, outside gas BBQ - no charge but some people didn’t appreciate that they were supposed to clean up after they used it. 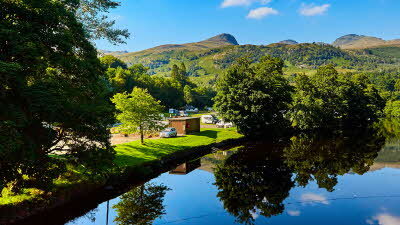 A great base for touring central Scotland and gateway to the Trossachs National Park and the Highlands. We shall be back. Excellent site - attractive, quiet and good location. 1 night stop-over whilst touring West Scotland but wish we could have stayed longer. 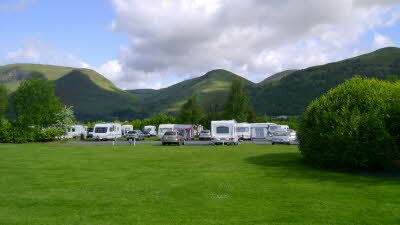 Well kept clean site, good choice of pitches. Our two cats enjoyed the woodland walks (we only take them out on harnesses/leads) nice variety of pitches - area for families (we prefer more tucked away pitches due to cats & found an area that was perfect) can't comment on facilities as we use our own but impressions were very clean & tidy. Definitely on list to return to. From the map, it looked as tho it might be in a busy urban area, but the site is part of the Blair Drummond country estate and the the CMC section of this affiliated site is within a large walled garden. Very quiet and peaceful level hardstandings with good facilities, tho a bit offputting to see dogs being walked around to do their 'business' on the grassed areas close to the caravans. I cant imagine spending a lot of time here, but its a great location for an overnight stay travelling to or from Scotland. We come up here as often as possible to relax in a great friendly place, child safe with a good play park. Lovely walks on the doorstep, safari park and plenty of other things very close by. Excellent toilet blocks which are great for families, modern good showers and always clean and well kept. Shops in Doune only minutes away by car or by bike. Great cycling on the doorstep. Very friendly staff and always willing to help. Fantastic bonus if you have kids is the satellite hook up at every pitch. Bring on old sky box or get a loan of one from reception and the kids are sorted. All said this is a great site in a very accessible part of the country that will not dissapoint you. Nice big hard standing pitches and not in regimental rows like a lot of sites.